My Accounting Course | Learn Accounting and Finance Online for Free! The Easy Way to Learn Accounting – for Free! Over 2,500 accounting topics and terms explained. Get started learning with these accounting course topics! 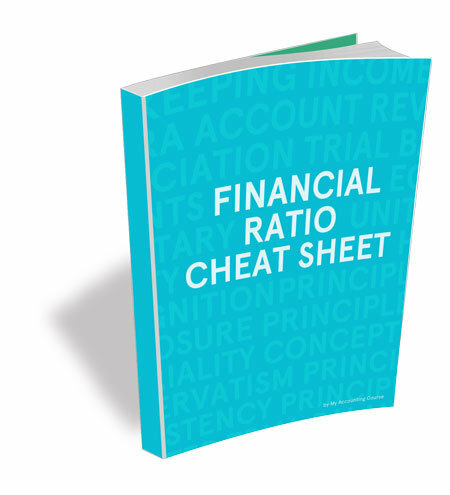 Enter your name and email below to sign up for the newsletter and get a free cheat sheet for practicing financial ratios. Join over 100,000 people who have used this guide to learn accounting. Don’t Know Where to Get Started? Don’t worry. You can check out the Getting Started Guide or start with these accounting topics! What Are People Saying About My Accounting Course? I love your way to explain in plane English the basic knowledge for this accounting course. Currently I am working on my MBA, however I don’t have background on accounting. This course has helped a lot especially for some of us without an accounting background and needed to understand the financials. I’m an MBA student from Uganda in Makerere University. These Journals will help me so much in my Masters course units in financial accounting. I am really excited about having this course for help on my college course. THANK YOU for all the time and effort you put into creating the My Accounting Course website. It was my go to when trying to understand the accounting course I took last semester in graduate school. It’s my go to now as I launch my own company and try to figure out all of the financial stuff on my own. Accounting Training for the rest of us! Hi, I’m Shaun. I’m a CPA who worked in Public Accounting for the better portion of a decade. Like many of you, I know from experience that accounting can be difficult to understand. Textbooks can be difficult to read and give you more information than necessary to understand accounting concepts. That is why I started MyAccountingCourse.com. My goal is to help you understand accounting principles by breaking down accounting concepts into everyday language, so you can understand them and learn faster– for free. MyAccountingCourse.com also has many examples of basic accounting events and situations for you to study. My example journal entries include diagrams and tables to help illustrate concepts in the study guide. I also have an ever-expanding accounting dictionary with hundreds of accounting terms for you to reference. After you get done using my accounting course, you can take advantage of the accountant career planning section. Whether you want to become a CPA, bookkeeper, or just understand your business better, I have information about how to use your new accounting knowledge. If you have any questions about accounting concepts or principles, my articles, or suggestions for new accounting topics, please feel free to email me.